Do you need book cover artwork? Richard will be happy to discuss all your requirements whether you are an experienced publisher or self publishing for the first time. This entry was posted in services and tagged art, artwork, book cover, book jacket, design, graphic design, graphics, illustration, illustrator on May 13, 2018 by richardcrookes. Latest news is this new deck of 48 cards has just been completed in collaboration with Barbara MeikleJohn-Free and Flavia Kate Peters once more. This follows on from the Witches’ Wisdom deck seen below and is due to be released through Llewellyn next year. Bright, colourful and mouthwatering to say the least – watch this space for more release details when available. This entry was posted in News, Uncategorized and tagged divination, oraclecards, pagan, paganism, tarot, witch, witchcraft on October 21, 2018 by richardcrookes. I thought it might be interesting to show the final files for the box artwork for a deck of cards…. Here are the top and bottom pieces of artwork for the Greek Mythology Reading cards available from Inner Traditions/Bear and Co, Findhorn Press, Amazon and all good book shops. This is complex and precision artwork involving many many layers. This entry was posted in Uncategorized and tagged art, artist, artwork, author, book cover, book jacket, design, divination, mythology, oracle, oraclecards, richardcrookes on July 12, 2018 by richardcrookes. The live show is scheduled for 10 am Seattle time , 6pm UK time and midnight Bangkok time on Monday 14th May 2018. This entry was posted in News and tagged #oraclecards #oracle #mythology #divination #richardcrookes on May 13, 2018 by richardcrookes. 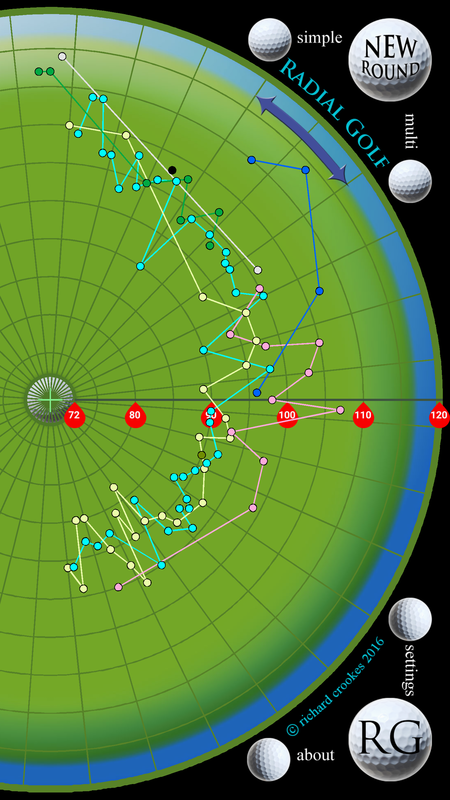 This is quite a diversion from my normal activity…a golf scoring mobile application. All the design, photography and concept is mine of course, but I have had the great pleasure to have worked with Loichai studio who have made this dream a reality for me. I started playing golf just over two years ago and looked for a scoring application to record my results. The ones I found were not what I wanted so I started to record them in my own unique way on a sheet of radial or polar graph paper my father had given me when I was young. The idea is that the centre of the wheel is a par score of 72 and the outer edge is set at 120. Every time you play you add another point to the curve in a clockwise direction. 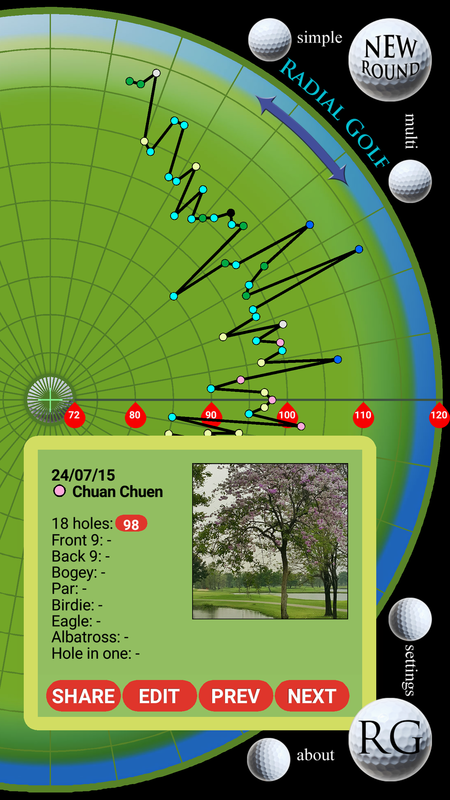 Ideally, as your scores come down you will create a ‘spiral of improvement’ and eventually hit the centre. I found this visual idea to be such a great incentive to get out and play, that I decided to create it as a mobile application so beginners like me, as well as more established golfers, could do the same. All the information is fully editable so you can add all your past scoring history, add photos, notes and maybe even excuses! 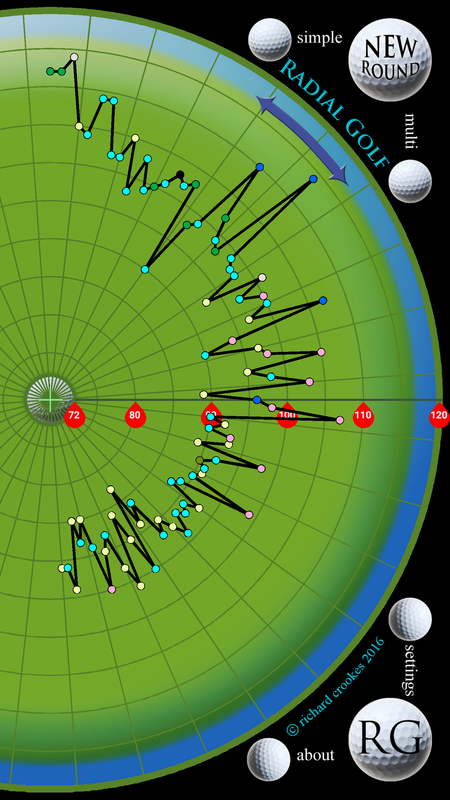 Radial Golf is available here in the Google Play store (for Android) and here in the Apple store. This entry was posted in News, Reviews, services and tagged golf, golfers, golfing, golfscore, golfscoring, sport on April 21, 2016 by richardcrookes. Here’s a new project in progress…a hand carved inscription on an old wooden stool. Lettering designed with double pencils on paper and written quickly and arranged in a simple block layout. It is such a joy to work in wood. The crisp crunch of a sharp chisel cutting through the grain a most satisfyimg sound. I love the simple utilitarian nature of the stool. It just came to hand as a pleasing idea to add some calligraphy to it. This entry was posted in Uncategorized and tagged art, bangkok, calligraphy, craft, graphic design, lettercutting, Richard Crookes, thailand, woodcarving on November 20, 2015 by richardcrookes.